This year is set to see a battle between two of the biggest entertainment behemoths in history as shoot 'em ups Call of Duty and Halo release sequels within a week of one another this November. The last Call of Duty grossed $1 billion faster than any entertainment product in history, beating James Cameron's Avatar to the record by 24 hours. 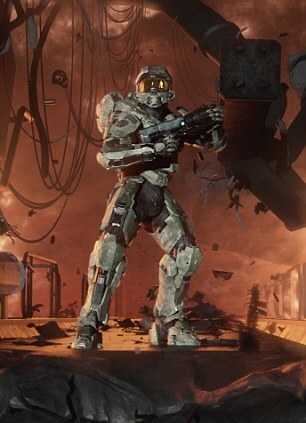 Halo 3 was the biggest entertainment launch of all time when it launched in 2007. The series has sold 40 million so far. Call of Duty Black Ops 2 will release on November 13 - just seven days after Halo 4. Analysts and critics are divided over which way the battle will swing. Call of Duty: Black Ops 2 is a radical departure for the series - abandoning the gritty realism and historical settings for a near-future look. Gamers have had mixed feelings about the first trailer - but many hope that it could rejuvenate the franchise. Although Modern Warfare 3 was commercially successful, it was less well received by critics - who claimed the franchise was becoming tired. 'Black Ops 2, thankfully, shows a way forward for the Call of Duty brand as it appears to be something genuinely new,' says Pat Garratt, editor of game news site VG247.